Orangeries date back to the 17th century so they were around well before the conventional conservatory gained its popularity, the conservatory has to some extent lessened during the past few years. Traditional Orangeries can be painted with classic colours like Vintage Cream, Mint Green or Gunship Grey among hundreds of other finishes available. What is an Orangery designed for? Well, it was designed originally to protect and house expensive imported plants and fruit from the frosts of the colder months in the U.K an Orangery had large windows set in a building made of stone or brick, thus affording the protection and sunlight required for the plants to flourish. A modern day Orangery keeps the traditional and unique character of centuries past whilst using the latest technologies in building and glass innovation to improve the Orangery into an elegant and stylish room to be enjoyed all year round. Orangeries are the perfect solution for those customers who would like some extra space to relax and enjoy views of their garden throughout the seasons and who prefer a more classic style than that of the modern conservatory. At Glass Design and Build we pride ourselves on the superb range of Orangeries which are available and designed specifically to each customer’s individual taste, thus creating truly unique bespoke Orangeries that can be enjoyed for many years to come. With french doors in the entrance to your Orangery you can enjoy a flood of daylight throughout your home. 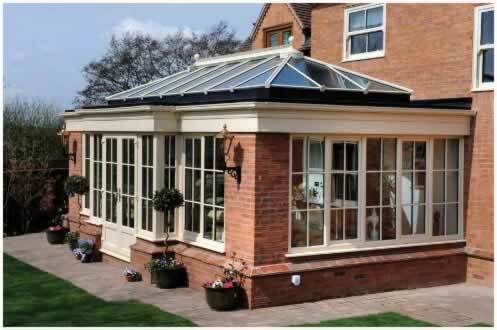 When designing your orangery we will discuss the many style options with you as well as the preferred materials of choice. All the materials we use such as timber, aluminium and even uPVC on our more standard ranges can be spray painted with a coloured finish to match any existing paint work, a classic and very popular Duck egg blue, mint green or vintage cream, which ever your preference to harmonize with the colour scheme of your home. Under floor heating can be supplied and installed to give a gentle warmth underfoot or at higher setting is a primary heat source to heat your orangery, air conditioning to maintain a crisp fresh breeze in the hottest months and radiators for the colder months. We can also attend to tiling of floor area`s and decorating of the interior walls. An Orangery will make the perfect dining room area to relax and enjoy family meals or entertain guests. 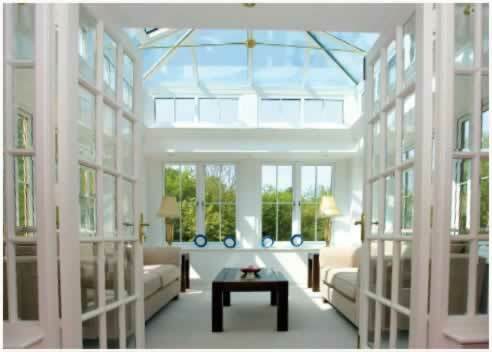 Installation of Orangeries is very complex and required expert installation. At Glass Design and Build we will take the hard work out of searching for many different trades people and will design, install and manage the entire project for you, therefore there will not be any worries for you about whether the builder, joiner, electrician or painter and decorator will turn up or do a good job. All our trades people are time served and have been working on our projects for many years so we can guarantee the high standard of our work. Contemporary styling can be added to orangeries with bi-folding doors and modern paint finishes.